The Script Editor view supports Qt Script. The Scripting view allows you to edit scripts to run in Storyboard Pro directly from the application. It displays a list of available scripts, from which you can select an existing script, edit it, test it and save it. The Script Editor will highlight the syntax of your script for easy reading. NOTE To learn more about scripting in Storyboard Pro, see About Scripting. Script Editor menu The menu for this view—see Script Editor View Menu. Script Editor toolbar The toolbar for this view—see Script Editor Toolbar. The list of script files available. 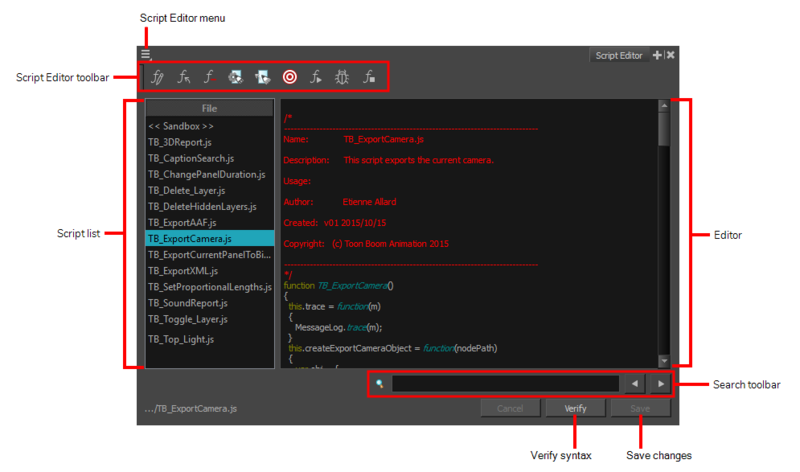 Selecting a script in this list will open it in the editor. NOTE The << Sandbox >> item at the top of the list does not correspond to an actual script file. It is a temporary container to type and test code, and its content cannot be saved. A text field in which you can edit the selected script. Allows you to type in a keyword and search for this keyword within the script. You can use the Next button to go to the next instance of the keyword and the Previous button to go to the previous instance. Cancel If you have made any changes to your script that you have not yet saved, this discards those changes and reloads the saved version. Saves the modifications you made to the script.